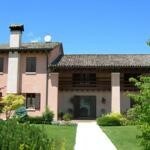 The B & B Zia Maria is the ideal house where to spend a holiday in the beautiful land of Marca Trevigiana. The Zanesco's Family always welcomes to you. The staff will give you the best advice for interesting Excursions through Veneto Region. Promo Expo 2015: For visitors presenting the entrance Expo ticket, the B&B Zia Maria will apply a special discount of 10% for minimum stay of three nights for two person. Promotion valid from 01st of January to 31st of December 2015.